RIO DE JANEIRO, Brazil -- Usain Bolt has completed his triple-triple, anchoring the Jamaica 4x100-meter relay to victory in the final to ensure three gold medals at three consecutive Olympics. The U.S. team was disqualified - again. Bolt waved the baton to the crowd after coasting across the finish in a winning time of 37.27 seconds for his ninth Olympic gold medal. Japan took silver in 37.60, with Aska Cambridge holding off American Trayvon Bromell by 0.02. The U.S. team was later disqualified for exchanging illegally outside the zone at the first change, and Canada was elevated to the bronze-medal position in a national record 37.64. It was the ninth time since 1995 that the U.S. men have been disqualified or failed to get the baton around at an Olympics or world championships. The Japanese team was technically flawless and had the lead going into the last baton change, but Bolt pulled away, as he has done so often, in what is most likely to be his last run at the Olympics. DISQUALIFICATION ALERT: The U.S. men's relay has done it again, being disqualified after crossing the line in third place in the men's 4x100. Canada was elevated to third place on Friday in a national record 37.64 seconds. 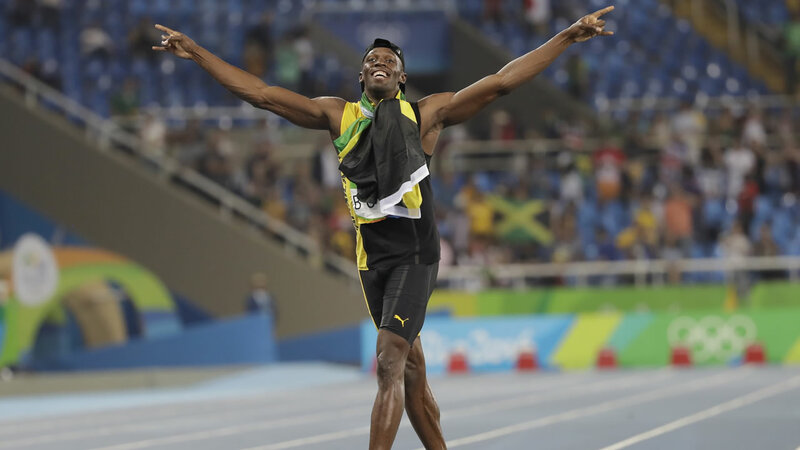 Usain Bolt anchored Jamaica to yet another win - his ninth Olympic gold medal - and Japan finished a surprising second. The team from Trinidad and Tobago was also disqualified. Jenn Suhr broke down in tears after failing to defend her gold medal in the pole vault and said she's scared about her health. The American says she's been sick for 10 days, was coughing up blood Friday and is now concerned her illness is worse than a respiratory infection. Suhr said she vomited twice during Friday night's pole vault and began crying as she discussed how she trained for four years for a repeat gold but is feeling sicker than she's ever felt in her life. Ekaterini Stefanidi of Greece won the gold medal in the women's pole vault with a mark of 4.85 meters. Cheick Sallah Sisse of the Ivory Coast has won the men's taekwondo gold medal in the 80-kilogram division after defeating Britain's Lutalo Muhammad in a finish that saw him surge ahead in the last second of the match. Sisse won Friday by a score of 8 to 6. Although Muhammad was leading through most of the fight, Sisse landed a back kick just as the match ended to put him ahead. Sisse, seeded third, won the African Championships this year in addition to the German Open. Muhammad previously won a bronze at the London Games. The men's bronze medals were won by Tunisia's Oussama Oueslat and Milad Beigi Harchgani of Azerbaijan. MEDAL ALERT: Usain Bolt has completed his triple-triple, anchoring the Jamaica 4x100-meter relay to victory in the final to ensure three gold medals at three consecutive Olympics. Bolt, who has won the 100, 200 and 4x100 relay gold medals at Beijing, London and now Rio, crossed in 37.27 seconds on Friday. Japan set an Asian record to take the silver in 37.60, holding off the third-place Americans by 0.02. MEDAL ALERT: Ekaterini Stefanidi of Greece has won the gold medal in the women's pole vault with a mark of 4.85 meters. Sandy Morris of the United States, silver medalist at the world indoors, took silver on a countback at the same mark and Eliza McCartney won the bronze in a New Zealand national record 4.80. Defending champion Jenn Suhr of the United States was eliminated with a mark of 4.60 and placed equal-seventh. Vivian Cheruiyot of Kenya won the women's 5,000 meters gold in Rio after overtaking Almaz Ayana of Ethiopia and setting an Olympic record of 14 minutes, 26.17 seconds. The 32-year-old Cheruiyot adds the Olympic title to two world championships in the 5,000 meters and one in the 10,000. She took silver in the 5,000 at the London Games four years ago. It initially appeared that Ayana would go for a second world record, after already setting a massive new mark in the 10,000 on the opening morning of the track program last week. But the efforts of the Olympic week appeared to catch up with her as she slumped late in the Saturday night race. Ayana set off strongly and seemed to take the lead for good after one third of the race. But fatigue caught up with her and Cheruiyot and compatriot Hellen Obiri, who won the bronze, saw their chance. The Americans, who needed to set a qualifying time in a solo rerun hours after dropping the baton in the preliminaries and getting a second chance on protest, won the final in 41.01 seconds. It was an impressive comeback after near disaster on Thursday, when Felix dropped the baton after being bumped by a Brazilian runner. That led to the re-run, and the Americans qualified fastest, taking the place of China in the final. MEDAL ALERT: Dilshod Nazarov of Tajikistan won the hammer throw at the Olympics, beating veteran Ivan Tsikhan of Belarus for gold. Nazarov threw 78.68 meters on his penultimate attempt on Friday, while 40-year-old Tsikhan had 77.79. Wojciech Nowicki of Poland took bronze with 77.73. Denmark will face France in the Olympic men's handball final after beating Poland 29-28 in extra time semifinal. Traditionally a power in the women's game, but having never won an Olympic medal, Denmark will be the underdog Sunday against a French team which is reigning Olympic and world champion. Poland had taken Friday's game to extra time with Michal Daszek's goal to tie the score two seconds before the end of the second half. However, good shooting and big saves from goalkeeper Niklas Landin Jacobsen brought Denmark the win. Earlier, France beat European champion Germany 29-28 in the first semifinal. France can become the first men's team to win three consecutive Olympic gold medals if it beats Denmark on Sunday. MEDAL ALERT: South Korea's Oh Hye-Ri has won the women's 67-kilogram taekwondo gold medal, proving once again that the country that created the martial art can sometimes still dominate. Oh defeated France's top-seeded Haby Niare in a tense, action-packed final. Although Oh didn't score until the second round, she quickly landed numerous head shots within about 30 seconds to take a definitive lead. Oh won by a score of 13 to 12. South Korea won only one gold medal at the London Games and has now doubled its count at Rio, after So-Hui Kim took gold in the women's light flyweight category on Wednesday. The women's bronze medals were won by Ruth Gbagbi of the Ivory Coast and Turkey's Nur Tatar. MEDAL ALERT: The U.S. women have retained the 4x100-meter relay title and helped Allyson Felix win her record fifth Olympic gold medal. The Americans, who needed to set a qualifying time in a solo rerun hours after dropping the baton in the preliminaries and getting a second chance on protest, won Friday's final in 41.01 seconds. A Jamaican team containing Elaine Thompson and Shelly-Ann Fraser-Pryce, was second in 41.36. Britain won bronze in a national record 41.77. The 30-year-old Felix entered the games as one of six women with four Olympic gold medals in track and field. .
MEDAL ALERT: Vivian Cheruiyot of Kenya set an Olympic record to win gold in the 5,000 meters, coming from behind to beat favorite Almaz Ayana of Ethiopia. Cheruiyot went past Ayana with less than two laps to go and could not be caught as she finished in 14 minutes 26.17 seconds. Hellen Obiri of Kenya took silver 3.60 second behind. Ayana, the 10,000 Olympic champion, finished in third in 14:33.59. UPSET ALERT: Jenn Suhr, the gold medalist at the London Olympics, is out of medal contention in the women's pole vault after failing to clear 4.70 meters. There were still six vaulters in the competition. The 34-year-old American had been sick and was "coughing up blood," her husband/coach Rick Suhr said before Friday's final. American swimmer Gunnar Bentz is back home, and he says he never lied about being robbed while out with teammates on the final night of Olympic swimming. In a statement released late Friday, he says he never saw anyone break down a bathroom door, and that the swimmers relieved themselves on nearby bushes after a night out. He says teammate Ryan Lochte tore a sign down from the building, and then the four returned to their taxi. He says they were ordered out of the cab by security guards and ultimately forced, with guns drawn, to sit on a nearby sidewalk. He says then, Lochte got up and yelled at the guards. A translator assisted and told them they needed to pay money to leave, Bentz says. He and teammate Jimmy Feigen paid about $50 in total, and he says the guns were lowered and they were allowed to leave. Bentz also says there were additional video angles that support his account that may not have been released. Javon Francis overtook David Verburg just before the finish to give Jamaica first spot in the first of the men's 4x400-meter relay preliminaries at 2 minutes, 58.29 seconds, 0.09 ahead of the American team, which led most of the race. Britain won the second heat in 2:58.88, holding off the Belgian team, which set a national record 2:59.25 to advance with the fourth-fastest time. The men's final will be the last track event in the Olympic Stadium on Saturday. Allyson Felix may get another chance at an Olympic gold medal, regardless of what happens in the 4x100-meter relay final, after the United States qualified fastest for Saturday's 4x400 relay final. Phyllis Francis anchored the 4x400 relay in the first of two preliminaries Friday night and finished 20 meters clear of second-place Ukraine in a season-best 3:21.42. Poland and Australia were third and fourth to reach the final. Jamaica won the second 4x400 qualifying heat in 3:22.38, followed by Britain and Canada. World champion Felix placed second in the 400, missing a record fifth Olympic gold medal. She did not run in the 4x400 preliminaries - which were scheduled less than two hours before the 4x100 final - but would be an obvious contender for a spot in the U.S. team for the 4x400 final. After the race, Francis played it coy when asked if Felix would the run the final, saying she'd leave the final lineup a mystery. One problem - Felix already has said she'd run. American swimmer James Feigen is on his way home from Brazil. The U.S. Olympic Committee says Feigen is on a flight that left Rio de Janeiro on Friday night. Feigen is the last of the four U.S. swimmers involved in a highly-publicized incident at a Rio gas station to leave the country. Earlier this week, a judge ordered Feigen's passport be seized while police investigated what swimmer Ryan Lochte initially described as an armed robbery. Police said the robbery story was fabricated and that the swimmers vandalized a gas station bathroom early Sunday after a night of partying. Before he was allowed to leave, Feigen agreed to pay $10,800 to a Brazilian charity. Milos Teodosic scored 22 points as Serbia, which pushed the star-studded U.S. team to the final seconds before losing earlier in the Rio Games, moved into the Olympic gold-medal game against the Americans with a shockingly easy 87-61 semifinal win over Australia on Friday. Stefan Markovic scored 14 and Nikola Jokic of the Denver Nuggets had 11 rebounds for the Serbs, who will get another crack at the U.S. on Sunday. The two-time defending titlists held off Spain 82-76 to advance. Serbia's win guaranteed its first Olympic medal in men's basketball since gaining independence in 2006. The Aussies, too, were hoping to play the U.S. again, but they scored just 5 points in the first quarter and will have to beat Spain for their first Top 3 finish. With five NBA players, Australia brought its most talented team ever to Brazil. But the Aussies couldn't overcome their horrendous start. For full coverage of the Olympic Summer Games, click here.